Date posted: March 2, 2015 by: JasonDarkX2 Category: Tech 4 comments. Earlier today Samsung electronics announce their new flagship phones the galaxy S6 and the Galaxy S6 Edge set to be available on April 10, 2015. Build from entirely of glass and metal delivering a seamless premium mobile experiences. Running on Android 5.0 (lollipop) OS on a 5.1’’ Quad HD (2560x1440) 577pp Super AMOLED (s6) or Dual edge (s6 edge) screens. Powered by a Quad 2.1GHz + Quad 1.5GHz, Octacore application processor. The Samsung galaxy and galaxy s6 Plus surely is packing a punch in the next generation of phones. Wait, that’s not all equipped with a 16MP OIS rear and 6 MP front facing camera. Available in 32,64, and128GB storage with a wide variety of colors to choose from such as White Pearl, Black Sapphire, Gold Platinum, and Blue. 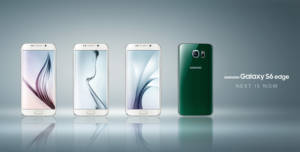 The Topaz is Galaxy S6 only and the Green Emerald is Galaxy S6 edge. only. With so much power and color of choice to choose from Samsung have truly crafted a beautiful device, Please take my money lol. But wait the fun doesn’t stop there the Galaxy S6 and S6 plus do pack some little gimmicks under the hood. Such as a cordless charging and super charging gimmick, when wired to charge the galaxy S5 is charged 1.5 times faster than the galaxy S5 offering 4 hours of usage in just 10 minutes of charging. But that’s not all the Galaxy s6 will also the feature Samsung pay later in the year an answers to Apple pay service.